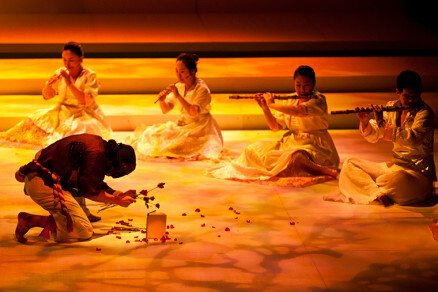 The stunning Seoul-based group Jeong Ga Ak Hoe, perform thoroughly unique interpretations of Korean traditional music alongside newly composed works for traditional instruments. The band’s eclectic repertoire has deep roots in the ancient Korean concept of Johwa, meaning ‘harmony’ or ‘balance’ and each performance is an expression of the transformative power that exists in music and nature. Bringing narrative, recitation, dance and video into their performance the group creates a ritualistic, genre-defying space where past, present and future coexist simultaneously; preserving and transforming the musical heritage of their ancestors.